JMT’s “Intermediate” RIBS solution is designed for larger and heavier parts that require higher tonnage press brakes and more traditional part inbound/outbound presentation methods. Here we begin with a larger, higher payload, pedestal mounted robot, positioned in front of the press brake, still with clearance for manual access/operation of the brake. Part flats are presented via conveyors, pallets (or both) and robot vision can be used to find and pick the blanks with or without the use of an alignment stand to final locate the bend lines. 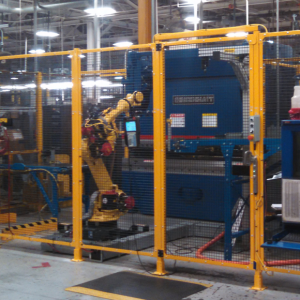 Formed parts can be palletized on outbound pallets, nesting as needed or removed from the work cell by conveyor. This ‘Intermediate’ RIBS cell is best suited for higher volume operations, parts that require 2 operators to handle, or higher tonnage brakes. JMT’s “Intermediate” RIBS are customer tailored solutions, solving unique customer needs with impressive ROI’s!